Partially weaken DEF of opposing team. Partially degrade co-op/raid boss's DEF, regardless of its daily weakness. Satana feeds on souls, drawing them out with a kiss in the traditional succubus manner. 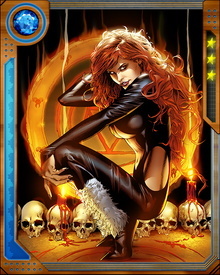 One of Satana's most dangerous powers is her control over the demon known as Basilisk, which is bonded to her soul. She can release and recover it at will.